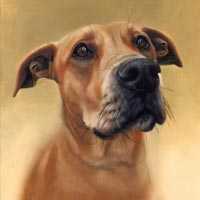 Sure, All My Pet Portrait Clients Are Happy! Well, you can never know for sure, can you? Even though my clients always say they absolutely love the portrait I've created for them. There is one thing I DO know for sure though, it’s a wonderful feeling to get news from a satisfied customer! The fact that I can make people this happy, makes me love my job even more! I have decided to publish some of the letters I've got here. These comments are usually very emotional and express someone's deep feelings, the testimonails really touch me to the bottom of my heart and are of immense value to me. I wanted to capture a moment in time before it was lost. Now, it is with me forever. Thank you, Katja, no one except you could have visualised Maggie so well. The shimmering light in the soft fur, the kindness in her eyes - truly beautiful! 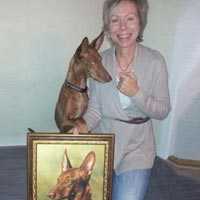 The painting just arrived and it's really great, I'm so glad that you painted the background a little darker than the photo, it's much warmer now. I'm so glad I let you paint for me and not someone else, you're so good and have such talent. Our beloved Dixie got sick and we had to let her fall asleep on March 1st. Looking at our beautiful painting several times a day, I'm so glad you created the painting before this happened. We have arranged lighting for it so we can enjoy our painting even when it's dark. 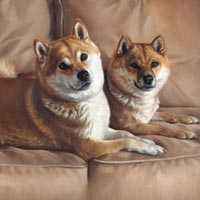 The painting is wonderful!! Thank you! It captures Winston's face and expression perfectly. And I think the red chair is such a nice contrast against the white fur. I know my parents will LOVE it and I will too! Thank you again for your outstanding work and I'm so glad that we connected on this project. The painting is gorgeous. You have really captured Maggie. She loved it. Thought you might like to share in the moment. We open presents as soon as the family arrives :-). The painting is absolutely fantastic, you've really captured my beautiful angel. Alice was my beloved soul mate, a very special little girl. The loss of her is huge, but every time I walk past the painting and see that beautiful look and personality, my heart swim with warmth. 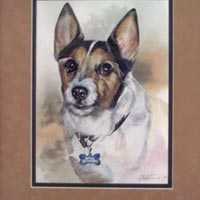 I am so thankful for this painting which brightens our home and will remind us every day of this beautiful little dog. When I saw the pictures in the email I got warm all over, What a beautiful painting you've done for me, Katja! THANKS! It would be perfect if I could come down and collect the painting this weekend. I am so incredibly happy, and it will be so much fun to come down and bring it home! :) I can't wait: D. THANKS again! Thank you so much for having the portrait arrive on time. My wife (and I) were both amazed at the painting. The detail is so incredible. Here are some pics of me, my wife and Poochi. 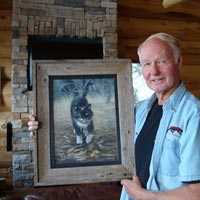 I look forward to having this painting in our house and will send you a picture when it is hung. I showed the portrait to Chad and he was very, very impressed. Thank you again for such a wonderful Christmas present. 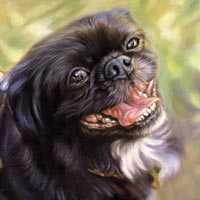 Our girl Darla immortalized! Both Alison love the Siberian Stretching Tiger and it is marvelous how you have captured the relief on his face whilst stretching. But we shamefully admit that our favourite is the Polar Bears. This is perhaps because we always wanted the bears and because the beauty makes them “come alive” but then so does your Tiger ……. 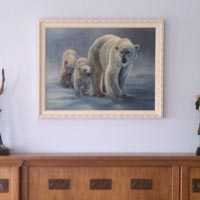 I guess we love them both but as you can see from the pictures, your Polar Bears allow our home to be a home. Exquisite indeed. Lots of love from the USA. I will regroup and establish contact again. Don’t forget us in the meantime. The painting is just beautiful! Simply amazing... Lastly, I do hope you signed the painting as all great artists do. : ) it is a masterpiece! the final portrait looks amazing. You have really captured their personality and expressions, Karen will love it. The frame looks great. The way you set it up really compliments the photo nicely. Overall, the work has definitely exceeded my expectations! I'm almost speechless... 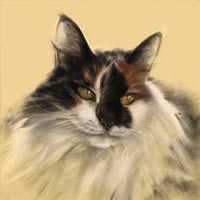 Thank you Katja Turnsek for drawing a Conte Pastel of my Queen Fluffan. He looks amazing, the likeness is incredible, especially his eyes and I am very happy with it. But gosh, you're incredibly good! You've captured Morris exactly as I wanted and a little more, even his glimpse in his eyes! I'm really happy, you'll have a thousand thanks! FABULOUS!!!!!! The portrait is absolutely stunning. You have captured her warmth and feeling as if I had just taken the photo Thank you! Hi Katja, That's perfect, I couldn't have hoped for more! I know you're a professional artist and you do this for a living, but I'm still amazed at how well you've captured them. Even though it's been almost a year since we lost Samantha, you have kept her alive with the stunning picture of our little girl. We now have so many memories because of all of your hard work. Memories that cannot be taken away. Everytime we look at the very realistic picture of her. Keep up the good work for those who follow. 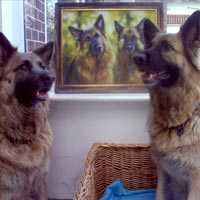 The painting you have created of our dogs, Amber & Tess, is stunning. The close-up pictures of them are amazing, their eyes and expressions are exactly right. 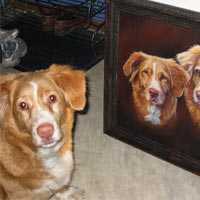 We can’t wait to recieve the painting and we will try and take a photograph with the girls for you to see the true likeness that you have created. What lovely horse and rider! Its really visible how Spice boy loves jumping, he is smiling and the eyes are very beautiful. Agnes really show full focus and concentration on the next obstacle. With mane and tail that flies (and the blurry background) it’s clear that you get an understanding about just how fast they are riding! I can understand how difficult it can be to paint that small detail, as you can find in faces; it’s probably very finically. 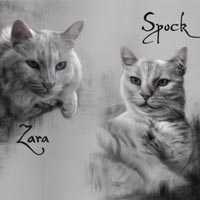 We love the painting! Waiting with excitement to see it for real. 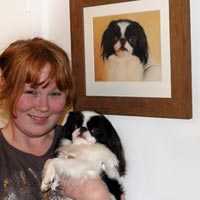 I hope I can collect the painting in Wednesday so she can receive it on her 15th birthday! A truly beautiful gift I believe. The beautiful painting is here and well. The UPS man brought it into our house and opened it to make sure it was perfect. He loved it too. We take it next week to get framed by the same people that will frame George's portrait. We will send you pictures from the dedication. We love the calling cards and postcards. Thanks again so much. 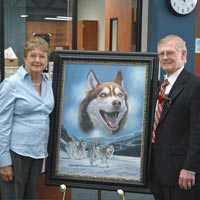 We are really excited to donate such a beautiful painting to the school. We are so pleased with our drawing. 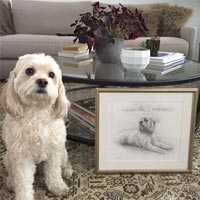 Once framed, we'll send a picture of both Flo and the portrait. It is absolutely wonderful. Thank you very much. I'm so happy. 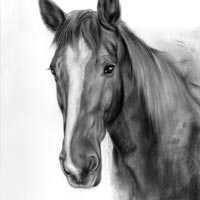 I will save a little and order of my own dogs and horses :). Thanks to you Katja, my boy will live forever! The drawing looks so much alive that it seems A'Tim could just jump out of the frame any time! 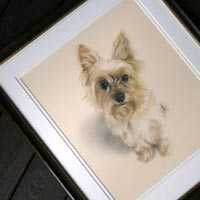 I must admit that I used to be a little skeptical about drawings or paintings of pets. 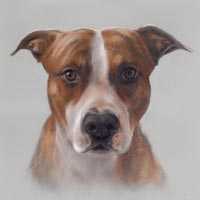 A painting could look very nice, but somehow I couldn't believe someone would be able to reflect the real soul of my own dog and the exact expression of his eyes and temperament. Well, I have to reconsider my point of view…. I wanted my boy just the way he is, in full action, charismatic and with the fire in his eyes that is so typical for him. This was a pretty difficult assignment, but you succeeded with glamour! 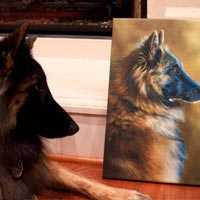 People who didn't even know I had him painted, immediately saw that it was him, although I have more dogs. I'm very proud of the drawing. It will get a place of honor in my house and it will "shine" on my car! My other boys can't wait for me to take a good action picture from them too to join the gallery! It looks absolutely amazing Katja!! I knew I picked a great artist. I went online initially and looked at 100's of artists and am so glad I went with you. 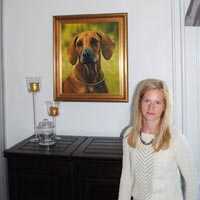 Hi, Katja - the portrait is lovely -- don't change a thing! The only problem is that looking at it I miss him so much, and it'll be another week before I'm home! You've really captured his heart as well as his face. It does not need any changes! It is absolutely perfect. God you are good. 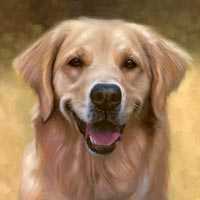 The portrait is just beautiful!! It captures her perfectly! 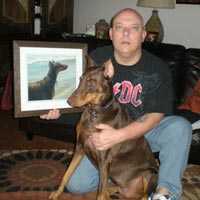 Jesse was a special dog to me, one of a kind. I just had to drive home on my lunch break to see if the painting finally arrived. Went to get it out, it is absolutely fantastic. I got tears in my eyes, so realistic that is almost scary. 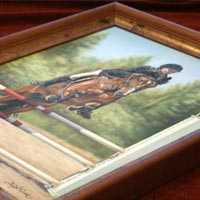 I now left it at the framer, a beautiful, slightly colorful frame and antique styled. It will look fantastic. 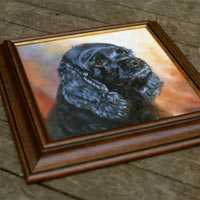 I will get it next Friday at earliest because they had to order the frame and it delivered in Thursdays. So now I will have to wait again… promise that you will get a photo of it when I get the framed painting back. Many thanks Katja; you should know that I spread your website to all people I know and I’m hoping you will get many commissions. 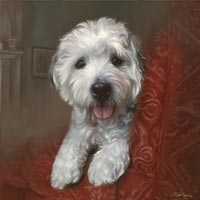 The painting of Valorie has arrived and it is absolutly stunning! 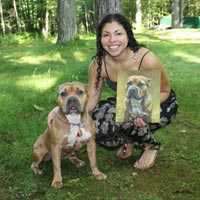 What talent you have...Thank you so much for the incredible, lifelike painting that you have created for me. I will enjoy it forever. Thanks for painting such a wonderful portrait. 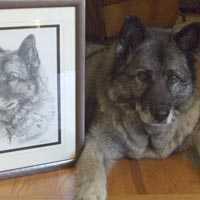 Here are two photos of Wolfgang with the painting. The portrait will be going to our framer shortly, but we thought you would enjoy the before and after. We are just thrilled. Wolfgang does show it, but he is thrilled also. Have a great week. … promise that you will get a photo of it when I get the framed painting back. Many thanks Katja; you should know that I spread your website to all people I know and I’m hoping you will get many commissions. Just took my first look at the final Bronte picture and am most happy. It’s wonderful. You certainly have a gift! 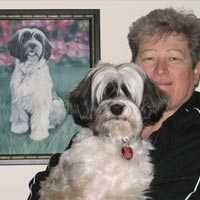 When Bronte died about a year ago, it devastated everyone in the family. I believe that your picture will bring back memories of a much happier time. Thank you again. I am already trying to get a few good photos of our two yorkies to send you for a dual portrait. One is a 15 lb. bully and the other a little feisty mooch. I will get in contact with you shortly. 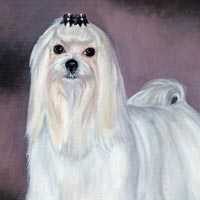 I just wanted to email and thank you again for the beautiful portrait of Coco. Mandy absolutely loved it! 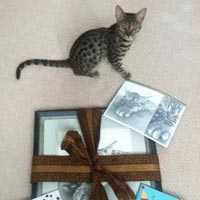 As you can imagine, it was a very emotional experience for her when she opened the package at Christmas as she only lost Coco 4 months ago. 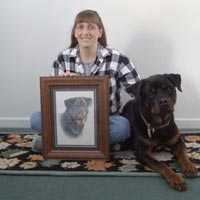 Everybody that has seen the portrait remark how talented you are and how much the portrait looks just like Coco. Many thanks for the wonderful painting you did of my Vilda (SEUCH Enigma Standing Ovations)! It is so natural and alive, every hair is at the right place, and her expression is so well interpreted. 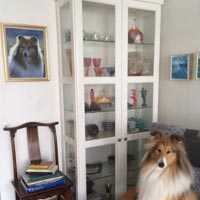 The painting has been given a prominent place in our home and all who see it are completely overwhelmed, you really succeeded and I will always be extremely happy with it! Enclosed please find a photo of us, not so good, but at least as proof of my appreciation! I'm very excited about the painting, it's absolutely amazing! 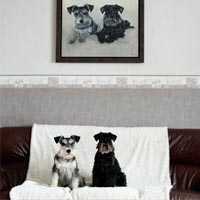 You've really captured both dogs' personalities, nicely done. It will accompany me all my life. I am speechless. It is the most beautiful portrait I have ever seen. Maybe I’m biased, but I think this is your best one. No all of them of great, but I think this is the best. 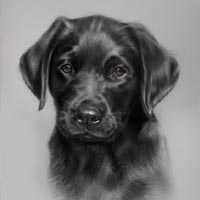 Black dogs are not only a difficult challenge to photograph, but also to paint. You made it look pretty easy. I am amazed and positive that the real portrait is even better than what I’m seeing here on the computer. 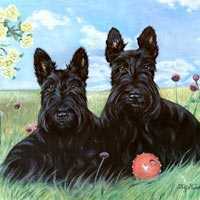 I just don’t know how to thank someone who helped so much to restore my wonderful and happy memories of these beautiful dogs I had in my life for 13 years. This portrays Katie and Quinn in their prime. You have captured their personality through their eyes. Katie was the more serious one, most of the time. Quinn was the forever puppy; he was always ready to play until his very last day. This painting and the process you and I went through together, has done so much to subdue the sadness of the last chapter in Katie and Quinn’s lives. This is most inadequate Katja, but thank you from the bottom of my broken, but now healing heart. 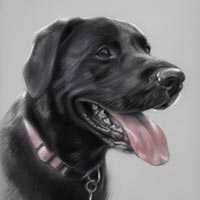 Thank you for the portrait of Salvia. You really succeeded to capture her personality and her expressive eyes. 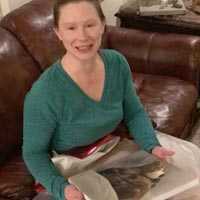 When we opened the package and saw the painting, it felt like she was with us again. 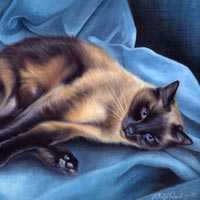 The portrait of Salvia really is the memory I always wished to have of my best friend. Oh, she CRIED and CRIED and CRIED and CRIED. Mom was totally unprepared and really didn`t have a clue. I first gave her a greeting card I made myself and my brother printed it on a beautiful and expensive paper. 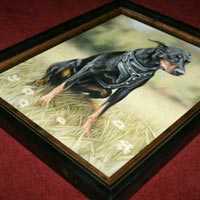 In it was a print of the painting from your web site. She was really happy and besides that there was couple hundred crowns. This money was for a frame, but of course she didn`t understand that... Then I told her to wait a moment and ran to get the package as I went towards her, she starred at me and understood right away as she saw the size of the package. She bursted into tears, didn`t even take the package at first. I just received my picture of Preziosa!! It came out soooooo beautiful!! My mom simply loves it!!! Wow is all I can say!! You have captured her perfectly!! 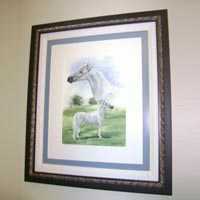 We are going to the store on Saturday to have it framed..I can't wait!!! Thanks again for Preziosa's beautiful picture. I have sung your praises on neapolitan.org and I do hope more business will come your way soon!! I finally got the portrait of Taisho back from the framers' and it looks great! 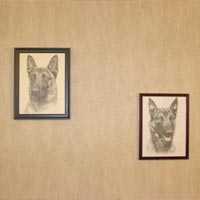 I put it on a wall in our master bedroom and had my wife close her eyes while I stood her right in front of it. I told her this was her belated and now long-awaited birthday gift that she was surely going to love -- and so of course she couldn't imagine what it was -- and she was brought to tears. It's such a lovely portrait. You really captured his character and this is a piece of art we'll cherish the rest of our lives. I'm really happy with how it turned out and feel so lucky to have kept digging on the Internet until I found you -- all the way in Sweden. 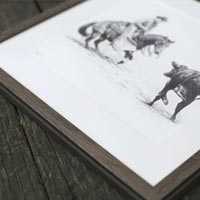 The framers, who have seen it all, were really impressed with your work too. The eyes, the depth to the work -- they were pretty astonished. Oh wow, it's gorgeous! Really love the colours, absolutely beautiful. She looks wonderful here, so nice to see her so bright and content. It makes me so happy to see her portrayed so lovingly. Hahahahah! It looks beautiful! Thank you. My girlfriend will love it! 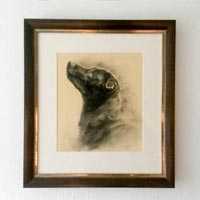 A great rendering of our goofy dog. 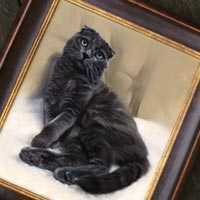 The cat portrait arrived today safe and sound via Fedex. I am absolutely amazed at how this turned out. Way above anything that I thought was possible. Thank you so much for all of your hard work. My wife is going to love this! It is really great :) I am really pleased!! 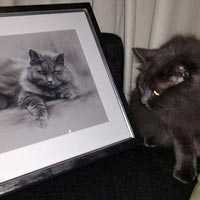 It will feel good to have it on the wall and be reminded of what a wonderful and beautiful cat Tjorven was. Thank you for your great commitment. 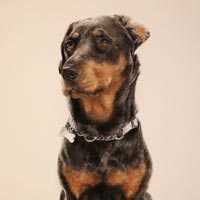 The portrait of Harley is just beautiful. I am so happy how it has turned out. It reminds me of how she looked last weekend at the beach!! So excited just waiting for us to throw her ball in the waves. 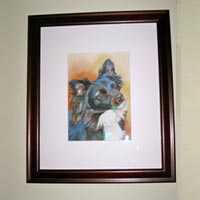 I am thrilled with Lilo's watercolor portrait that I received today! Not only is it artistic, but it really does capture his personality. I can't wait to have it framed and displayed. This will be a beautiful keepsake that I will treasure for the rest of my life. Thank you for making this such an easy process. I really found it comforting and enjoyable to view each stage of the your work. 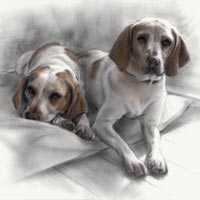 I am hoping to get another puppy at the end of the year and I will definitely seek you out again. Thanks again for everything, it has been a pleasure! Hope you had a good Easter! 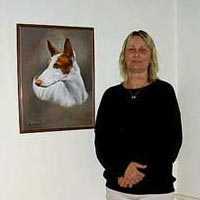 The portrait is just wonderful. You have captured Star in such a lovely ethereal way. I wouldn't change a thing! Thank you so much. Kat: I JUST GOT IT YESTERDAY!!!!!!!!!! Incredible!!!!!!!! I LOVE IT !!!!!!!!!!! BECAUSE OF "YOUR GIFT" YOU are going to help me TOUCH Victoria's Heart tomorrow, CHRISTMAS DAY!!! i WILL EMPLOY YOUR GIFT AGAIN IN THE FUTURE!!!!! GOD BLESS YOU KAT!!!!!!!!! Hi and Happy Holidays to You Todd was soooo touch with his painting. I had it framed with a suade matting! Not a great pic but the only one i have. thanks sooooo much for making such a beautiful gift. 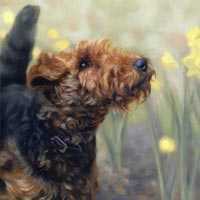 I was on the site to peek and the portrait it's just magnificent, you managed to paint so many details on this tiny size! How are you? I want to thank you for the nice drawing, that you've made of Thor. It was a nice surprise to get the drawing for my birthday! The drawing is amazing, you made Thor really come alive on paper. 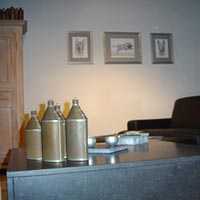 We will give the drawing a nice place in our livingroom, next to the one of Zoran. 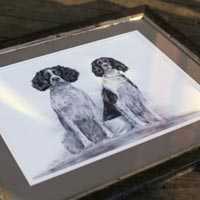 We are very happy with the 2 beautiful drawings of our dogs and very proud to have them hanging in our house! I hope you are enjoying the summer. I just remembered I never sent you the photos of my Uncle George opening up the picture of Farley. He absolutely loved it! 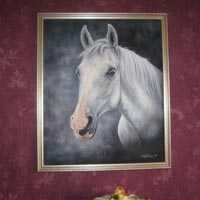 My aunt and uncle hung said everyone who comes into the room compliments them on the beautiful portrait. I love it!! It's fabulous. You captured him beautifully, his expression even the sheen on his nose! I can't wait to get it. Thank you so much. Sorry It's taken me a while to get back to you. 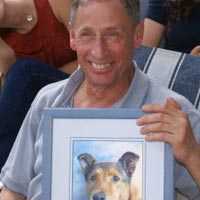 The picture of George arrived last Thursday and we love it, you have done a fantastic job. It's quite difficult to get George to pose next to the picture but after several attempts we finally have a photo! Thanks again for your hard work, the picture looks amazing and has pride of place in our home. Where to start? 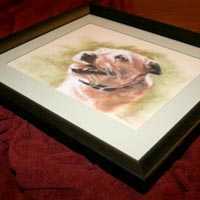 In my order information section you will find out how to commission your pet portrait. 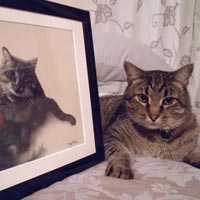 So, how much is a portrait? That depends on which medium and size you would like. Visit my price-list to find out. 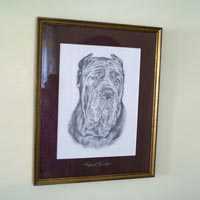 A masterpiece should get framed with museum quality framing, visit my framing section to find out more.